The Author of the following Letters takes the liberty, with all proper deference, of laying before the public his idea of ”parochial history”…. This daybook, which I feel is something akin to what Gilbert White would consider “parochial history,” began in 1972 with the gift of a barometer. My wife, Jeanie, gave the instrument to me when I was succumbing to graduate school stress in Knoxville, Tennessee, and it became not only an escape from intense academic work, but the first step on the road to a different kind of awareness about the world. From the start, I was never content just to watch the barometric needle; I had to record its movement, then graph it. I was fascinated by the alchemy of the charts that turned rain and sun into visible patterns, symbols like notes on a sheet of music, or words on a page. From my graphs of barometric pressure, I discovered that the number of cold fronts each month is more or less consistent, and that the earth breathes at an average rate of about once every three to five days in the winter, and once each six to eight days at the peak of summer. A short apprenticeship told me when important changes would occur and what kind of weather would take place on most any day. That information was expressed in the language of odds and percentages, and it was surprisingly accurate. Taking into consideration the consistency of certain patterns in the past, I could make fairly successful predictions about the likelihood of the repetition of such paradigms in the future. As Yeats says, the seasons “have their fixed returns,” and I found points all along the course of the year which appeared to be fixed moments for change. The pulse of the world was steadier than I had ever imagined. My graphs also allowed me to see the special properties of each season. August’s barometric configurations, for example, are slow and gentle like low, rolling hills. Heat waves show up as plateaus. Thunderstorms are sharp, shallow troughs in the gentle waves of the atmospheric landscape. Autumn arrives like the sudden appearance of a pyramid on a broad plain. By the end of September, the fronts are stronger; the high-pressure peaks become taller; the lows are deeper, with almost every valley bringing rain. By December, the systems loom on the horizon of the graph like a range of mountains with violent extremes of altitude, sometimes snowcapped, almost always imposing and sliced by canyons of wind. From watching the weather, it was an easy step to watching wildflowers. Identifying plants, I saw that flowers were natural allies of my graphs, and that they were parallel measures of the seasons and the passage of time. I kept a list of when each wildflower blossomed and saw how each one consistently opened around a specific day, and that even though a cold year could set blooming back up to two weeks, and unusual warmth accelerate it, average dates were quite useful in establishing sequence of bloom which always showed me exactly where I was in the progress of the year. In the summer of 1978, Jean and I took the family to Yellow Springs, a small town just beyond the eastern edge of the Dayton suburbs. We bought a house and planned to stay. 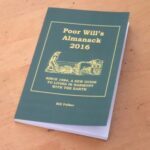 I began to write a nature almanac for the local newspaper. To my weather and wildflower notes I added daily sunrise and sunset times, moonrise and moonset, average and record temperatures, comments on foliage changes, bird migration dates, farm and gardening cycles, and the rotation of the stars. The more I learned around Yellow Springs, the more I found applicable to the world beyond the village limits. The microclimate in which I immersed myself gradually became a key to the extended environment; the part unlocked the whole. My Yellow Springs gnomon that measured the movement of the sun along the ecliptic also measured my relationship to every other place on earth. My occasional trips turned into exercises in the measurement of variations in the landscape. When I drove 500 miles northwest, I not only entered a different space, but often a separate season, and I could mark the differences in degrees of flowers, insects, trees, and the development of the field crops. The most exciting trips were taken south in March; I could travel from early spring into middle spring and finally into late spring and summer along the Gulf Coast. My engagement with the natural world, which began as an escape from academia, finally turned into a way of getting private bearings, and of finding a sense of values. It was a process of spiritual as well as physical reorientation. The extremes of that process often puzzled me as well as my family and my newspaper readers. Why I felt compelled to go well beyond a barometric notebook and end up describing the average weather and the state of nature on each day of the Yellow Springs year I have not the slightest idea. My existential search for home must have required it of me, and so, in that sense, all the historical statements in this collection of notes are the fruit of a strong need to define, in maybe excessive detail, where I am and what happens around me. Here are no stories told you of what is to be seen at the other end of the world, but of things at home, in your own Native Countrey, at your own doors, easily examinable with little travel, less cost, and very little hazard. This book doth not shew you a Telescope, but a Mirror, it goes not about to put a delightful cheat upon you, with objects at a great distance, but shews you yourselves. The format of all my notes in this daybook owes more than a little to the almanacs I wrote and continue to write for newspapers, magazines and NPR. The quotations, daily statistics, the weather outlooks, the seasonal calendar, and the daybook journal were and still are part of my regular routine of collecting and organizing impressions about the place in which I live. –Setting: The main habitat described here is that of Glen Helen, a preserve of woods and glades that forms the eastern border of the village of Yellow Springs in southwestern Ohio. At its northern edge, the Glen joins with John Bryan State Park to form a corridor about ten miles long, and half a mile wide, along the Little Miami River. The north section of the Glen Helen /John Bryan complex is hilly and heavily wooded, and is the best location for spring wildflowers. The southern portion, “South Glen” as it is usually called, is a combination of open fields, wetlands, and wooded flatlands. Here I found the flowers and grasses of summer and fall. Together, the two Glens and the John Bryan Park provide a remarkable cross section of the fauna and flora of the eastern United States. Other habitats in the daybook journal include my yard with its several small gardens; the village of Yellow Springs itself, a town of 4,000 at the far eastern border of the Dayton suburbs; the Caesar Creek Reservoir, twenty miles south of Yellow Springs and created by the Corps of Engineers in 1976. My few trips away from that environment were principally northeast to Chicago, Madison, Wisconsin and northern Minnesota, east to Washington and New York, southeast to the Carolinas and Florida, southwest to Arkansas, Louisiana, and Texas, and occasionally to California and the Northwest, two excursions to Belize in Central America, one to Italy. —Quotations: The passages from ancient and modern writers (and sometimes from my alter egos) which accompany each day’s notations are lessons from my readings, as well as from distant seminary and university training, here put to work in service of the reconstruction of my sense of time and space. They are a collection of reminders, hopes, and promises for me that I find implicit in the seasons. They have also become a kind of a cosmological scrapbook for me, as well as the philosophical underpinning of this narrative. —Astronomical/Almanac Data: I have included the sunrise and sunset for Yellow Springs as a general guide to the progression of the year in this location, but those statistics also reflect trends that are world wide, if more rapid in some places and slower in others. Even though the day’s length is almost never exactly the same from one town to the next, a minute gained or lost in Yellow Springs is usually a minute lost or gained elsewhere, and the Yellow Springs numbers can be used as a simple way of watching the lengthening or shortening of the days, and so of watching the turn of the planet. For those who wish to keep track of the sun themselves in their own location, abundant sources are now available for this information in local and national media. —Average Temperatures: Average temperatures in Yellow Springs are also part of each day’s entry. Since the rise and fall of temperatures in other parts of the North America, even though they may start from colder or warmer readings, keep pace with the temperatures here, the highs and lows in Yellow Springs are, like solar statistics, helpful indicators of the steady progress of the year everywhere. See the general “Guide to the Nation’s Weather” at the beginning of each month’s Daybook. —Weather: When I first decided to keep weather records, I had no way of knowing what they might tell me. Within a decade, the charts and graphs showed that clear divisions consistently occurred between seasons and subseasons during certain weeks. The 17th century tools with which I worked, a barometer, a thermometer, and a notebook, revealed not only broad trends in the year, but often the specific day on which the natural calendar turned from one period to the next. My daily, weekly and monthly weather summaries have been distilled from over thirty years of observations, and offer a statistical description of each day in southwestern Ohio. Although my interest in the Yellow Springs microclimate at first seemed too narrow to be of use to those who lived outside the area, I began to adjust it to meet the needs of a number of regional and national farm publications for which I started writing in the mid 1980s. Soon I was finding that what had happened in Yellow Springs was applicable to many other parts of the country, and farmers in Michigan told me they could plan the cutting of their hay better with my guidelines than with satellite predictions. While the summaries are based on my records here in southwestern Ohio, they can be and have been used, with a little interpretation and interpolation throughout the lower Midwest and East. Most weather systems listed here generally cross the Mississippi a day or two before their passage into Ohio, and the East Coast typically experiences a version of Yellow Springs weather within 24 hours of its passage here. Regional barometric fluctuations reflect a relationship between local weather and weather all across the country, and those variations create not only images of parochial natural history, but also portraits of the general climate. When the barometric pressure falls and rain or snow occurs in Yellow Springs, I know that a cold wave is sweeping across Illinois and Indiana, will reach me in a few hours, and be in Pennsylvania within a day. Like swells in the ocean, these atmospheric waves are connected to each other and have somewhat predictable intervals. Their progress through Yellow Springs can be, therefore, a guide to the extended environment. No satellite is needed to see them, no technology more recent than that of the 17th century. Since the general pivot times of seasonal change are dependent upon the regular patterns and predictable characteristics of these high and low pressure systems the same key patterns that cause Yellow Springs weather to change usually cause similar changes to the north and south. For example, although early spring comes to central Ohio in the third week of February and does not come to Minneapolis until April, a shift towards milder conditions does occur in Minnesota and throughout the country in the middle of the year’s second month – be it accompanied by snowdrops or simply by a slight decrease in average temperatures. Since the rise and fall of temperatures in other parts of the North America keep pace with the temperatures in this village, a thermometer here can also be used to estimate the weather throughout the hemisphere. From the 40th parallel – which lies just a few miles from Yellow Springs – the coldest months show temperatures about two to three degrees colder every one hundred miles north, two to three degrees warmer every hundred miles south. In the milder months, the differences shrink to one degree per hundred miles. With those broad guidelines and a map, one can calculate temperatures most anywhere east of the Mississippi, and estimate with some accuracy the location of the seasons at any time of year. From its birth along the Gulf Coast in January, spring comes north one hundred miles every week. Making the journey to Yellow Springs in about two months, it brings the crocus to southwestern Ohio by the first week of March, and into the country’s northern rim by the end of April or the first of May. A little division and interpolation, and one might, if he or she wished, estimate tulip or daffodil time for any yard or village all along that path. In autumn, killing frosts move down from the Canadian border at about the same rate as spring warmth approaches from the Caribbean, striking near Winnipeg in the first weeks of September, reaching the Ohio Valley toward the middle or the end of October, and arriving in Georgia by the end of November or the first weeks of December. Although conditions for a garden-killing freeze can vary from yard to yard, say nothing about from state to state, one position on the seasonal trajectory suggests the positions of other locations as well. And although the leafturn cycle is as dependent upon the sun as upon the weather, fall colors typically follow the frost: aspens peak in the Rocky Mountains in early to mid September; a month later, the country’s midsection begins the best of its maple color; and most deciduous trees lose their leaves in the South by late November. Wherever a person may lie on that or any other phase of the year, he or she can use that knowledge to understand movement elsewhere. —The Natural Calendar: This seasonal summary includes approximate dates for astronomical events such as star movement, meteor showers, solstice, equinox, perihelion (the sun’s position closest to earth), and aphelion (the sun’s position farthest from earth). Here also I note the progress of foliage and floral changes, farm and garden practices, migration times for common birds, and peak periods of insect activity. Some of these notes are second hand; I’m a sky watcher, but not an astronomer, and I rely on the government’s astronomical data and a few other references for much of my information about the stars and the sun. I am also a complete amateur at bird watching, and most of the migration dates used in the seasonal calendar come from published sources. And even though I keep close track of the farm year, the percentages listed for planting and harvesting are interpretations of averages supplied by the state’s weekly crop reports. At the beginning of each spring and summer month, I have included a wildflower calendar which lists blooming dates for hundreds of wildflowers in an average Yellow Springs season. Although the flora of the eastern and central United States is hardly limited to the species mentioned here, the flowers listed are common enough to provide easily recognized landmarks for gauging the advance of the year at almost any location; with such a point of reference and monthly temperature averages, a serious dandelion watcher in Yellow Springs, in Maine or in Arkansas can keep in touch with probable conditions throughout much of the country. —Daybook: The daybook journal consists of my notes on what I saw happening around me in Yellow Springs between 1979 and 2015. It is a collection of observations made from the window of my car and from my walks in Glen Helen, in other parks and wildlife areas within a few miles of my home, and on occasional trips. It is a record that anyone with a few guidebooks could make, and it includes just a few of the natural markers that anyone might discover. The cumulative format of the journal, which brings together all of the annual entries for the same day, has shown me the regularity of the changes in the seasons, and it fleshes out a broad, slow picture of each segment of the year. The repetitions of similar observations are included as I originally put them in my notebook because of the lessons they taught me, that each portion of the year is remarkably similar to that same portion each year, and that the differences can easily be measured by any number of plants, birds, and insects. Each piece of information is a particle of each season, without which fragments there would be no visible year at all; together the pieces demonstrate to me that the year truly is the sum of its parts; the more parts one can identify, and the more years one can add to the mix, the more the whole becomes. The daily cumulative record has also taught me something that my life has taught me too, that years and days and seasons eventually blend together, becoming unified and whole, one spring or summer standing for all those springs and summers that came before and all that will follow, and, in some ways, one day even standing for and somehow actually turning into every day.